Facebook is the most popular social media tool around. Therefore, using it to leverage a live music venue makes perfect sense. In addition to securing your clients with a Live Music Venue Insurance Program to mitigate risk and financial responsibility, share the following advice with them about how to promote their venues on Facebook. There are a wide variety of Facebook apps to make your music venue’s Facebook Page more interactive. Some of these apps can even be used to turn your page into a direct marketing and sales tool. For example, the Venue Profile app from ReverbNation enables you to sell tickets to shows and events, provide location information, collect email addresses through a special signup form, create a calendar for upcoming shows and events, and stream performances. The app can be published on both your Facebook Page and your Facebook Places page, says Sprout Social. No one will want to visit the venue if the Facebook page is dull and irrelevant. Focus on creating fun and engaging content to share with followers. Be consistent in posting and publish plenty of pictures and videos of what an experience the venue is actually like. Announce new employees and drink/food specials as well! Use Facebook ads to promote the venue in a traditional marketing sense. Further, post discounts, deals, and promotions directly on the venue’s Facebook page, as well. 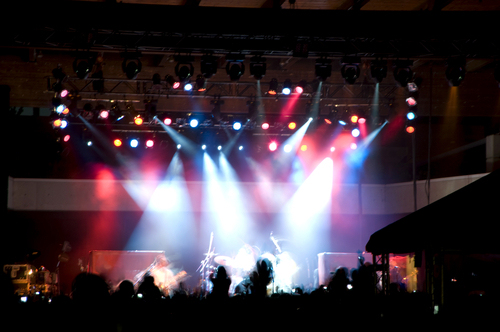 Contests provide another great promotional opportunity for your music venue. Ask customers to upload pictures of themselves wearing your venue’s branded merchandise and offer a prize for the funniest picture, or the picture that includes the most people wearing your T-shirts. The prize should be enticing enough to encourage people to participate and to drive the biggest buzz about the contest, says the article.